Cast: Jason Clarke, John Hawkes, Jake Gyllenhaal, Josh Brolin, Elizabeth Debicki, Emily Watson, Keira Knightley. Review: Eight thousand, eight hundred and forty eight metres, the height of the tallest mountain in the world, a place where the temperature never rises above freezing, going as low as minus 36 degrees Celsius in the winter and rising to minus 19 degrees in the summer (on average.) The challenges and risks of climbing this beast is one that would probably make many people considering to ascend it running scared. Even the most experienced of mountaineers can encounter problems and make a fatal mistake, and after watching this drama come true story about a 1996 expedition to Everest’s summit, one may rethink any aspirations to take on this perilous quest, in a similar vein to 2013’s Gravity, that may have killed any desires to become an astronaut amongst audience members. The opening captions at the beginning only remind viewers of the sheer dangers that climbers face when taking on this challenge. The human body is simply not built to function at those altitudes. The film focuses on several expeditions seeking to reach the top of the world, which just so happen to be led by rival companies. One of these led by Rob Hall (Jason Clarke) and another by Scott Fischer. (Jake Gyllenhaal) During a fateful excursion to the summit, problem after problem begins to surface, and these snowball (pun intended) into a desperate fight for survival for our group of mountaineers. As was the case with Gravity, it could have been easier for them to shoot on green screen, however director Baltasar Kormákur puts the viewer right into the heart of the mountain with some majestic shots of the summit and surrounding areas, whilst cleverly using places such as the Ötztal Alps in Italy to double up as Everest. The use of practical shooting locations which also included Nepal gives the film definitive authenticity. The audience feels like they are climbing the mountain with the climbers, and feel the sense of peril that the group find themselves in when the storm closes in. With quite an extensive cast, including some big Hollywood names, you would expect the acting to be top of the range, and well it is. The likes of Josh Brolin, and Jake Gyllenhaal do deliver some wounded and yet powerful performances, but the centre fold of the film is Jason Clarke’s Rob Hall and he is the star of the show as the leader of the main expedition featured. It is mainly through his perspective that we watch the events unfold as the expedition bids to reach the summit. Yet with many people in the film, there is a risk that the extensive cast get shall we say, swallowed up by the mountain, and unfortunately this does come to pass. The film tries to flit from one expedition to another with multiple strands of the story, thus making it difficult for the audience to keep track of what is going on all the time. The cinematography and the score are both tremendous, with the latter adding much to the film’s tension filled scenes. In addition, the nature of the story is extremely impactful. “Because it’s there,” a line that is often said in the film. Yet it serves as a reminder for the viewer that just because something as wondrous as Everest is there, the challenges and risks of climbing it are extensive, and a quest to summit the top of the world is one that should not be taken lightly. 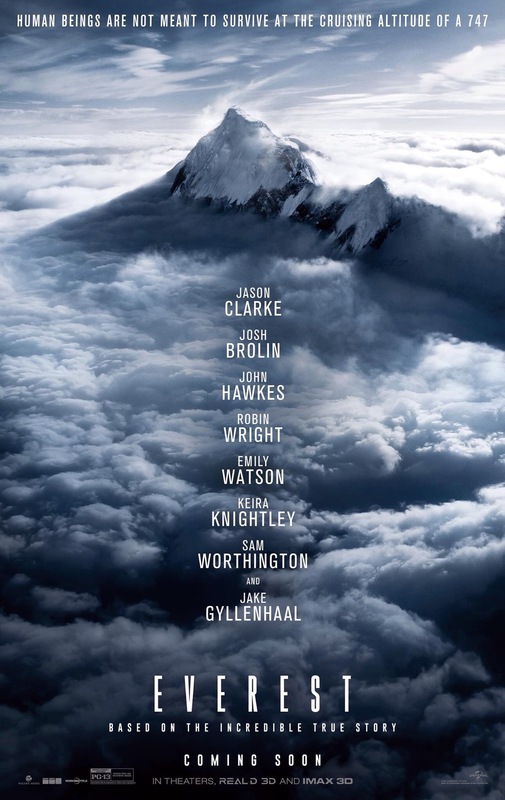 Visually mesmerising, with some great individual performances crammed into the somewhat overcrowded cast, the downer is that many of these performances end up being lost in the vast white slopes of Everest itself.